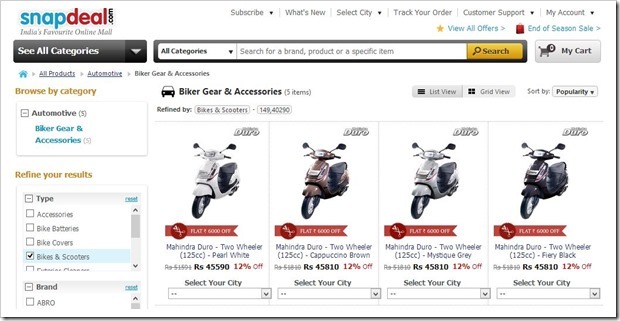 Snapdeal starts selling Automobiles online! 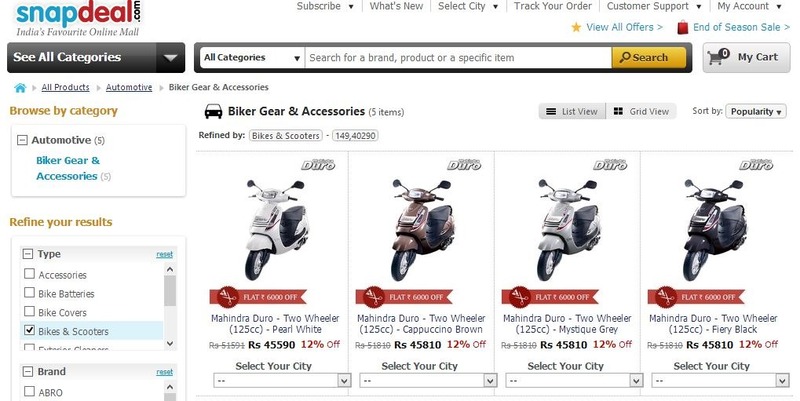 Snapdeal.com, one of the leading Indian ecommerce portal, has now started offering automobiles on sale online. They have forged a partnership with Mahindra & Mahindra to offer range of their two-wheelers. This is probably for the first time that a mainstream online retailer is offering automobiles for sale online. With a product like automobiles, the sales cycle is obviously different, but from what Snapdeal has detailed the entire process well and have taken care of nearly everything that a potential buyer may want to know. 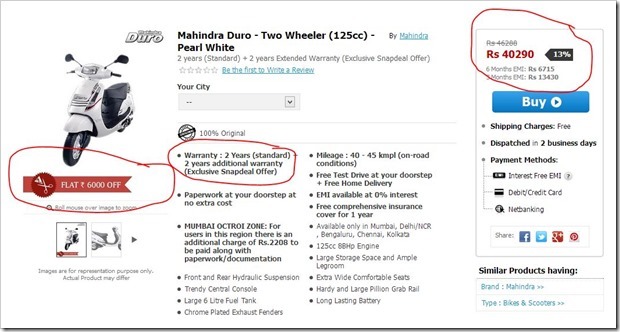 Because Snapdeal has forged a direct partnership with Mahindra & Mahindra, they are also able to offer some really good discounts and deals on the vehicles on offer. For eg: Mahindra Duo (125 cc) is offered at a price of Rs. 40,900, which includes a discount of Rs. 6000. From what I know, it will be tough for a offline retailer to offer that kind of discount. 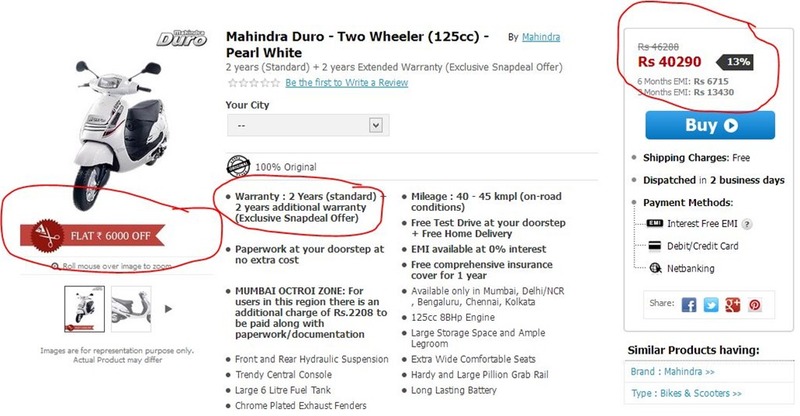 In addition to this, snapdeal is offering additional 2 years warranty (along with regular 2 years from M&M), which makes the deal all the more appealing for the potential buyer. Also, snapdeal.com customers can buy the vehicle at 0 percent interest rate with 3 and 6 months EMI. Customers will have to call Snapdeal Customer support and book a Test Drive. A Mahindra executive will arrange it in 3 days. Once a test drive is done, you can complete your online purchase. After online order is placed, Mahindra executive will visit your home to finish the paperwork and formalities. Within a week, vehicle will be delivered at the door-step of the customer. While, many buyers may not be comfortable buying automobiles online, given that customers are directly in touch with Mahindra executive should put most of the fears to rest. Additionally, the discounts and goodies offered online are quite tempting and customer does stand to save good amount of money. If Snapdeal and Mahindra are able to execute the entire process of buying and delivery of vehicles smoothly without delays, I am sure the trend of buying automobile online will catch one. Would love to hear what the readers think of this? With Quad-core mobiles under 15K, What will the Biggies do? Audiobooks – Just a fad or the real deal? Snapdeal Unbox Diwali Sale: 10 Awesome Deals You Should Not Miss!